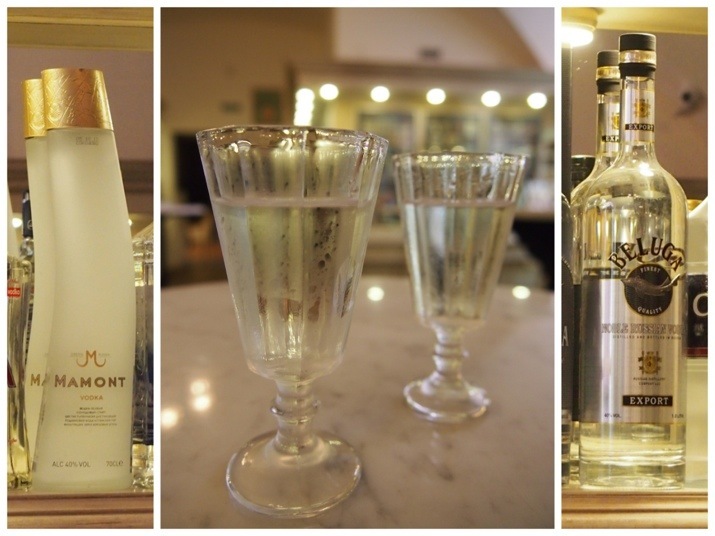 Today we decided to fully immerse ourselves in Russian culture and went to a vodka museum and tasting session. 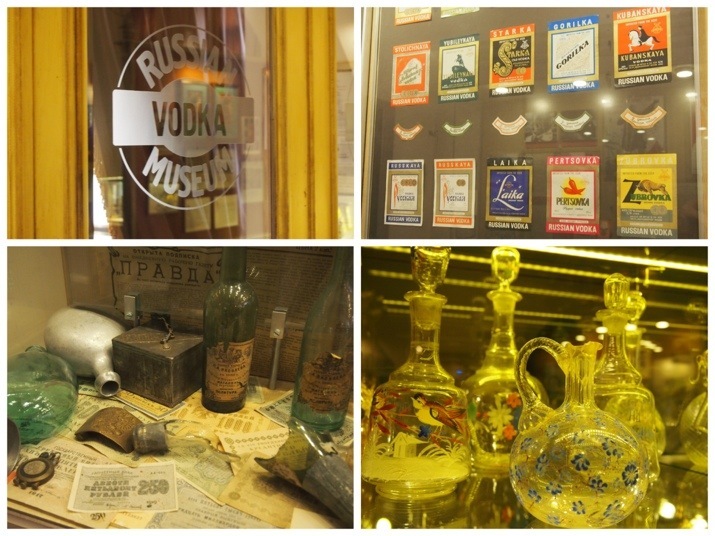 The Russian Vodka Museum has various displays explaining the history of vodka in Russia, how it is made, and lots of different glasses, bottles and labels from through the years. Unfortunately, none of the explanatory signs are in English so we paid the additional price to have a short tour (from the barmaid as it turned out). This was definitely worthwhile and she told us how grains used to be fermented in a big pot before Russians learnt to use proper distillation equipment from travelling in Italy, how Russians got round the two periods of enforced Prohibition in the 20th century (vodka on medical prescription, and home distillation if you were wondering), and why Russians toast any major event with vodka. Emperor Peter the Great loved vodka and used to play tricks on his guests. If anyone arrived late for dinner he would make them drink a litre of vodka from a huge glass – like a very extreme version of ‘catch up’. He also liked to wait until his guests were quite drunk and then serve them with plates of red crayfish which would start to move! Instead of cooking them which makes the crayfish turn red (and kills them), they were prepared by steeping in vodka which makes them red and sleepy so that they only began to move after they were served. 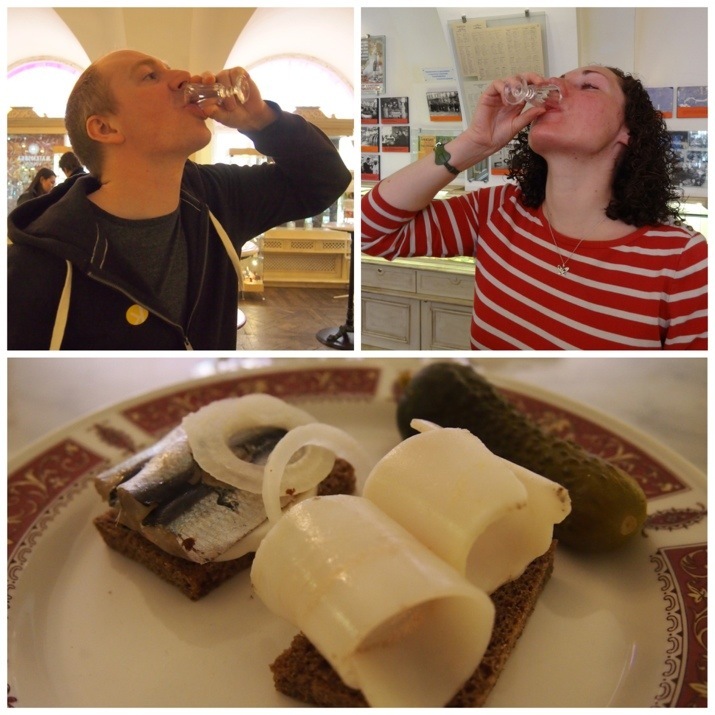 After the tour, we had a vodka tasting with 3 different types of vodka (Russian Standard, Gold and Platinum) which were served with 3 different Russian canapés (zakuski) – pickled herring with onion and boiled egg on rye bread, pork fat with horseradish on rye bread, and a pickled cucumber. Our tour guide advised us that vodka should be downed in one gulp, as you get more drunk if you sip it, but I found that was easier said than done and it took me several swigs to empty each glass! The bar in the museum stocks 220 different kinds of vodka which can be tried if you find that you’ve got a taste for it after the first three. We decided to try a couple of the pricier ones (around £5 for 50ml so still not breaking the bank) to see if we could tell the difference between those and the ones that we’d just tasted. Andrew got the Beluga and I decided to try the Mamont. And the difference? 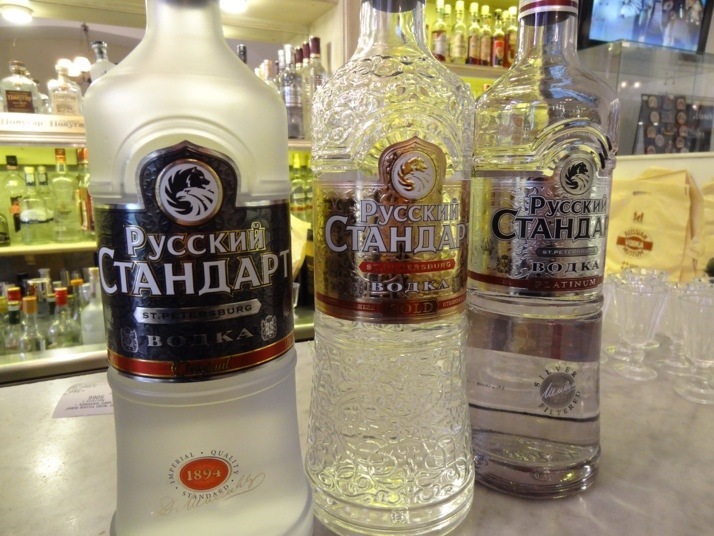 They were both pretty smooth, but we couldn’t really tell them apart and I don’t think they were any better than the Russian Standard Platinum… Underdeveloped tastes at least allow for cheaper drinking! This entry was posted in Places and tagged Museum, St. Petersburg, Vodka on April 23, 2013 by Julie. Its amazing what you two will do in the search for knowledge, I can only imagine the pain in having to drink the first samples and then the steely determination to carry on to the next round without any thought for self preservation ……. 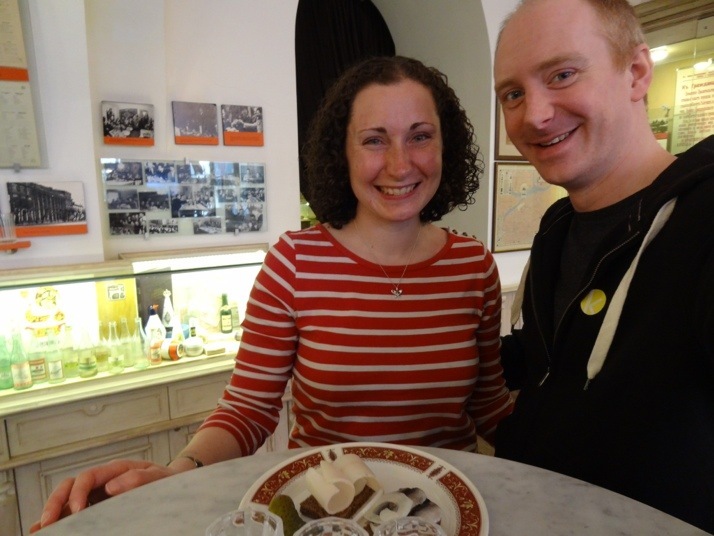 Please if you go anywhere near a chocolate factory – save yourselves !! The vending machine on the picture is not for vodka but for sparkling water – it is written on the machine. Hi Jarda, thanks for the correction – I’ve updated the caption. 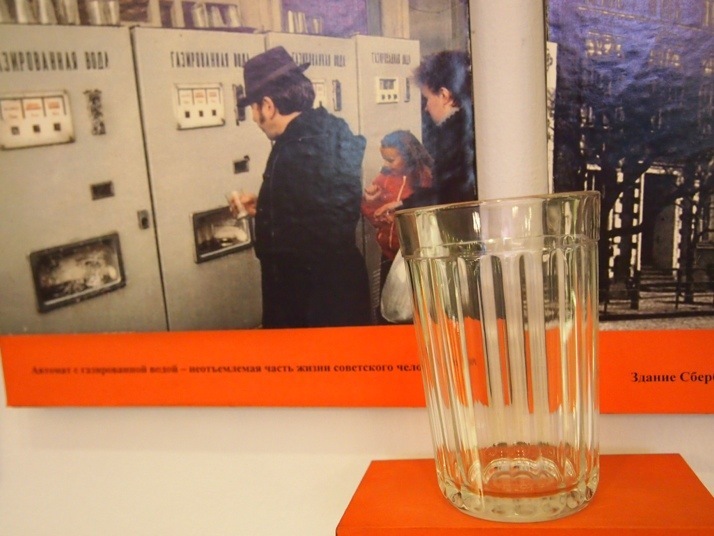 As we couldn’t read the text in the photograph or the Russian caption we assumed that it must have been dispensing vodka, after all it is in the Vodka Museum!